Attending a regional business conference? Or perhaps you’d like to take a grand vacation at Jamaica or Puerto Rico. 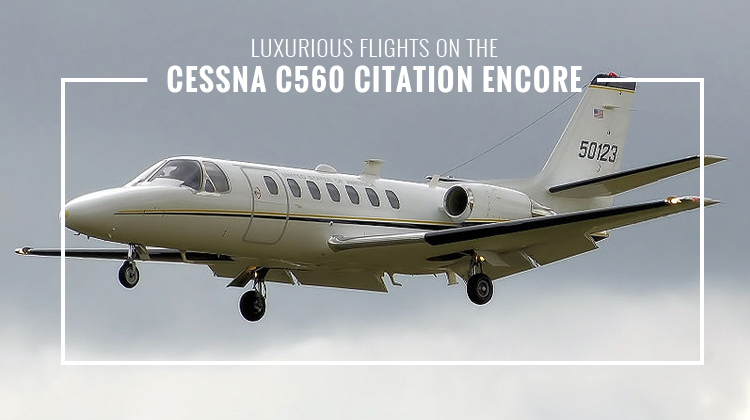 Either way, you can take on a luxurious flight by going aboard the Cessna C560 Citation Encore. This aircraft has comfy features which can accommodate up to 7 passengers. Among small jets, the Cessna C560 Citation Encore is considered to have the longest passenger cabin. Amazingly, this plane also has STOL (Short Take Off and Landing) capacities. This means you can fly from or to smaller airports which are nearest to their target destinations. Another standard in-flight feature of the Cessna C560 Citation Encore includes WiFi. This facility lets you stay connected with family, friends and professional networks whether you’re travel for leisure or business purposes. If you’re flying for a conference, you can use its comfy seat’s pull out table as a platform. In here, you can read emails, prepare documents or read through your slides should you be preparing for a presentation. This same table’s main function would be for passengers to relish their refreshments throughout the flight. Know more about the Cessna C560 Citation Encore’s specifications and make the most of your upcoming trip. Schedule your very own, private jet today. The Cessna C560 Citation Encore has comfy interiors to ensure passenger enjoyment. Upon hopping on board the plane, you’ll see its standard features where the cockpit is on your left. As you walk to the right, you’ll see a galley which can double as a pantry to keep your snacks. The same galley is built with small appliances such as a small refrigerator, microwave oven and even a coffee maker. Cutlery and wine glasses are usually included. As you charter for a private jet aboard the Cessna C560 Citation Encore, be sure to confirm the plane’s exact facilities. This way, you can gauge the level of comfort you’ll have on the trip. When lined up with other long range planes, the Cessna C560 Citation Encore can be found to provide a competitive performance. Its STOL capabilities will let you land directly on an island or mountain top without having to ride a boat or a jeep. You can also choose to fly from or to smaller airports, if you’re opting out of crowded ones. Should you want to reach an airport much nearer to your intended location, then you can do so even if it’s much smaller than standard ones. With its first flight in 1987, the Cessna C560 Citation Encore is among the Citation V series. The said series initially had the United States Army and United States Marine Corps as its primary users. Its civilian and military operators come from the United States, Peru and Colombia among other countries. The series has 8 variants and its planes are considered among the largest among straight wing planes. Today, roughly 168 units of this plane is being flown all around the world.